Applying known technologies to everyday practical uses has become commonplace for consumer products, and enzymes are no exception. Probiotic yogurt, laundry detergent, and shampoos use enzymes because of their effectiveness and versatility. In fact, health store shelves sport enzyme products promising to work all sorts of miracles, including improved digestive systems, strengthening hair and giving it shine, and keeping oils and greases from leaving unsightly stains on clothes allowing them to last longer. The success of enzyme use in consumer products has overflowed into pools and spas, and the recreational water industry has embraced their use for supplemental maintenance purposes. If used correctly, enzymes can eliminate oils and other organic contaminants in pools and spas, which lead to waterline formation, frequent filter media cleaning, and cloudy water. How do enzymes perform such tasks? Oils and greases will accumulate overtime if not broken down properly. Hot spots for oil accumulation are the filter bed and waterline. Routine activities such as sanitizing, oxidizing, and brushing keep accumulations to a minimum; however, applying an enzyme product provides an extra combatant against the build-up of oil and grease, while also decreasing the likelihood of waterline formation and cloudy water. Further, organic material that collects on filter media can impede efficiency. Enzymes also work to breakdown this material, giving the filtration system back its swagger. Sanitizer and oxidizer usage can also be decreased when using an enzyme product as it helps to breakdown organic contaminants, allowing sanitizers (e.g. chlorine) to focus more on killing bacteria. Enzymes have a unique way of achieving the performance profile just described. Chemical reactions often need a drill sergeant to speed them up and make sure everything goes smoothly. Chemicals known as catalysts perform this function. Another feature of catalysts is they do not deplete while performing their duties. For instance, a catalyst can be likened to a wedding planner. They are not getting married or part of the wedding party, and therefore their lives are not going to be changed as a result of the wedding; however, their duties are integral to the process. Once their current wedding is complete, the wedding planner moves on to the next one. The wedding planner is the catalyst, which moves the process along more quickly and smoothly to completion. Enzymes are a specific type of catalyst made up of globular proteins, which consist of long chains of amino acids. A model of a typical enzyme is depicted in Figure 1. The long chain of amino acids comprises an enzyme, which form twists and folds. The active sites of enzymes are embedded within these twists and folds and are where the catalytic reactions occur. When an enzyme is applied to a body of water it comes in contact with organic material and binds to it at the active site. From there, the enzyme breaks the organic material into smaller pieces. Once this process is complete, the small pieces are released, and the enzyme is free to perform the reaction over again. 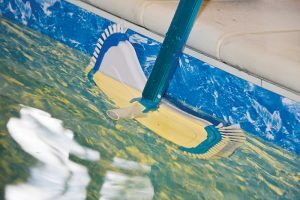 In a swimming pool setting, these smaller pieces will be filtered out instead of clinging to the waterline or causing cloudy water. No matter the application, enzymes serve two general purposes: speeding up and facilitating chemical reactions. The increase in rate of reaction afforded by enzymes allows living things to carry out chemical tasks that could essentially take thousands of years. Enzymes do not have universal functionality, however. Their activity varies with the environment. 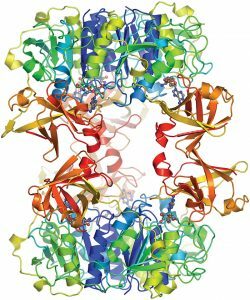 For instance, temperature, pH changes, water activity, ionic strength, and other variables determine whether an enzyme is just a useless protein or a catalyst capable of performing its duties. For example, why are insects not seen flying around during the winter? One reason is related to enzymes. Insects cannot maintain their body heat during the winter, which slows down enzymatic activity. The enzymes insects use to maintain life are only effective in a specific temperature range. Therefore, an enzyme that is effective in one environment may be completely inactive when introduced into another. As another example, using an enzyme in a swimming pool that is not chlorine tolerant would be counterproductive. Fortunately, the enzymes used for recreational water treatment are effective and compatible with a wide range of pool and spa parameters and maintenance products. In addition to using enzymes, routine activities such as sanitizing, oxidizing, and brushing help keep the accumulation of oils and other organic contaminants to a minimum. Chlorine and bromine systems are equally compatible with pool and spa enzymes. Weekly shocks do not interfere with enzymatic activity if the enzymes have been chosen specifically for pool and spa use. Algaecides, whether being used for routine maintenance or treatment, are also compatible with pool and spa enzymes. Other pool and spa water treatment accessories such as clarifiers can be used in the presence of enzymes as well. The reason why they have such varied compatibility is the enzyme’s specificity. Enzymes are highly specific in the reactions they facilitate; however, sanitizers, oxidizers, clarifiers, and scale inhibitors, for example, do not react with enzymes employed for pool and spa use. What about products which mix enzymes with existing chemicals or cleaners? Enzymes can be mixed with other chemicals to improve the performance profile of the product. For instance, surfactants, which employ their own grease and oil cutting abilities, can be mixed with pool and spa enzymes to create superior performance for eliminating water line and other oil accumulations. Typically, surfactants are chemicals with a high pH, which are capable of lowering the surface tension of oils and greases. The decrease in surface tension allows for the oil to be pulled into the water where it can be destroyed. Coupling a surfactant with enzymes gives a dual action capability to keeping a pool clean and clear. It has been established that enzymes provide the response times necessary to speed up life sustaining reactions. And, since enzymes occur naturally in everyday life, it has opened the door to more products featuring them. As a result, by using enzymes, many pool and spa chemical manufacturers have answered the call to produce high quality, effective chemicals that are also environmentally friendly. Given enzymes are highly effective at breaking down contaminants and originate from natural resources, they have become an ideal supplement for any pool or spa owner with a desire to make their maintenance program greener. In addition to being green, they also offer two qualities that are not usually paired together: flexibility and specificity. Being flexible allows enzymes to work well with all halogen (i.e. chlorine and bromine) systems. They ease the strain on sanitizers and shocks by eliminating grease and oils. This can be especially advantageous during peak usage times. Further, clarifiers, shocks, and sequesterants pose no compatibility problems for enzymes. The ability to combine enzymes with surfactants creates uniquely effective cleaners and pool maintenance products. What about specificity? Pools and spas are prone to certain types of contaminants. The oils and greases commonly found in pools and spas as a result of the environment and bather waste can be targeted by the enzymes. Thanks to product compatibility, specificity to contaminants, and all natural quality, enzyme water treatment can be beneficial for any pool or spa. This article was written by Claudio Azurmendi and originally appeared on Pool & Spa [link].